Special Note For "Website Evaluators"
Ray Cerveau, Mind Control Columnist for the Weekly World Inquisitor, presents a shockingly believable vision of a near-future dystopia after the NWO crack down on personal mind-control protection! Details and photos of these forgotten passive mind-control satellites from the 1950-60s. Giant aluminum balloons in space that bounce psychotronic signals. One was even deployed inside the US Capitol Building! The Washington Post exposes orthonoids to the truth of mind control with interviews of paranoids using AFDB technology. 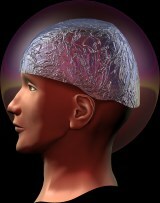 The Government doesn't want people shielding their home in aluminum to stop pesky, mind-controlling neighbors. IMPORTANT NEW RESEARCH: Do not supercool your AFDB as it may facilitate brain scanning. Ostensible BBC exposé on mind control that is itself mind control aimed at promoting a Hollywood movie. Promises link to AFDB resources to help the afflicted but mysteriously neglects to provide it. WARNING: Do not stare into hypno-eye illustration without running MindGuard. House covered in sheet tin and psychotronic grounding poles. Occupants safe from all harm. Briton constructs Alumin(i)um Shielded Enclosure for protection from headache-inducing mind-control mast. This site is dedicated to spreading the word about the Aluminum* Foil Deflector Beanie and how it can help the average human. Here you will find a description of AFDBs, how to make and use them, and general information about related subjects. I hope that you find the AFDB Homepage to be an important source of AFDB know-how and advocacy. What are you waiting for? Make one today! BEWARE OF COMMERCIAL AFDBS: Since you should trust no one, always construct your AFDB yourself to avoid the risk of subversion and mental enslavement. Sometimes, AFDBs will be sold on places like eBay. Do not purchase these pre-made AFDBs, even if the seller seems trustworthy. They may contain backdoors, pinholes, integrated psychotronic circuitry or other methods that actually promote mind control. AMIGA AND LINUX USERS: It is advised that you get a copy of MindGuard for your personal anti-psychotronic needs. Although an AFDB is an effective guard against most forms of psychotronic mind control, it is no substitute for the comprehensive protection afforded by MindGuard. * FOOTNOTE: The American spelling** of aluminum is used here. If you are searching for more information on aluminum, be aware that the British spell it "aluminium" (and pronounce it accordingly). ** HISTORICAL FOOTNOTE: Aluminum was originally named "alumium" by Sir Humphry Davy, who later changed it to "aluminum" (perhaps in an attempt to make it more Latinized since alumen is Latin for alum, the aluminum compound that the name is derived from). The British (and allied English speakers) shortly thereafter changed the name once more, this time to "aluminium" so that it would again match the pattern of most other elements (helium, sodium, etc. ), while the North Americans eventually decided to keep the second, slightly more traditional name. I predict that North Americans will adopt the more regular "-ium" spelling by the year 2050, prompting the British to start calling it "alumininium". At that point debate can begin on changing "platinum" to "platinium"